Flipkart Online Services Pvt Ltd, which runs the e-commerce site Flipkart.com, is close to raising $150 million in a PE round of funding from the private equity firm General Atlantic Partners, in the biggest deal ever in an Indian Internet company that values Flipkart at $1 billion (Rs 4,400 crore), at least two sources familiar with the development told VCCircle. With this deal, India joins mature markets like the USA and China, with billion-dollar valued Internet firms. It also shows how General Atlantic, which has $17 billion assets under management, is aggressively pursuing Internet companies. Earlier this year, it has reportedly bought 0.1 per cent stake in Facebook in a deal that valued the social networking website at $65 billion. In an e-mail response, Pat Hedley, managing director (Corporate Affairs), General Atlantic said, "It is our company policy not to comment on investment opportunities that we may or may not be considering." This is the fourth round of funding for Flipkart, which has recently raised $20 million in its series C round of funding from New York-based Tiger Global Management LLC. It had earlier raised seed funding from Accel Partners. 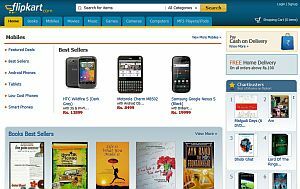 Flipkart was founded in 2007 in Bangalore as an online book retailer and has since diversified into a generic e-commerce site, selling CDs/DVDs of music, movies, games and software, as well mobile phones and electronics. Touted as one of the hottest Internet companies, Flipkart is in a high-growth phase. "The company is selling goods worth $6 million per month," said one of the sources close to the development. As of June, 2011, Flipkart had 1,500 employees on board and offices in Bangalore, Mumbai, Delhi, Chennai and Kolkata. In December last year, the company acquired social book discovery tool WeRead from Lulu, a US-based on-demand publishing firm. Private equity investors are essentially trying to replicate success that they have met with venture businesses in China, among the few other emerging economies. In the past 10 years, China has created giant e-commerce companies like 360buy, TaoBao and Tencent. And one of the main reasons that these companies came about was "they were consistently backed by private investors. Indian e-commerce is playing catch-up with Indian firms, raising money at big valuations. In another deal announced today, Jasper Innovative Marketing Solutions, which owns the popular group buying portal Snapdeal.com, has raised $40 million from Bessemer Venture Partners, NEA Indo-US Ventures and Nexus Venture Partners at a valuation of Rs 1,000 crore. There are a host of other e-commerce websites which have raised money in the recent past, such as LetsBuy.com, which has recently raised $6 million from Helion, Accel and Tiger Global. With moneybags back for funding, these Internet ventures and entrepreneurs are thinking big once more and analysts are questioning whether a bubble is in the making. However, there are some fundamental reasons why e-commerce is set to take off in India, which explains why the surge is bigger and better than before. According to experts, the next decade will bring massive growth in the Internet sector in India, supported by highly favourable demographics, growing Internet-broadband penetration, launch of 3G network, growing middle class-income levels, noticeable pick-up in tech-gadget and mobile culture, and surge in home-grown Internet start-ups. Also, there is a thinking that about 20 per cent of retail sales will happen online in India as it is more cost -efficient and organised retail has not really taken off in the country. While there are macro favourables in place, e-commerce, like most other businesses, boils down to an execution play and is creating a customer-delight experience.